Former multinational corporate affairs professional, Shabaka Gibson, brings 15 years' experience in economic development, government affairs and workforce development to consultancy. 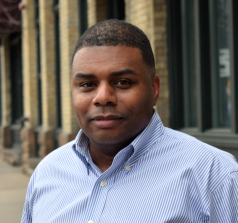 MADISON, Wis. - Feb. 20, 2017 - PRLog -- After fifteen years in military, business, and corporate development positions, Shabaka Gibson joins Ady Advantage in its Madison, WI office as Senior Vice President. Shabaka is responsible for new client development, new product development, strategic planning, and risk management. "Shabaka complements our agency in so many ways," says Janet Ady, president of Ady Advantage. "He brings leadership and expertise in talent strategies, strategic planning, defense economics, and workforce and community development." Shabaka started his career in 2001 as a Military Intelligence Officer with the United States Army Reserve. Most recently, he worked in corporate affairs for ExxonMobil leading planning, development, and advocacy programs in the U.S. and across the world. Prior to his position with ExxonMobil, he spent five years in economic development and municipal leadership. "Over my career, I've learned that there is no 'one thing' that leads to success in building and shaping communities or businesses," said Shabaka. "It takes a multi-disciplinary approach focusing on strategy, risk management, flawless execution, and measurement." In addition to economic development activities, Shabaka has led and worked on projects and programs in domestic and international government relations, regulatory affairs, policy/legislative advocacy, and international development. "Ady Advantage has an excellent reputation in the areas of economic development strategy, marketing, and site selection services across the country," said Gibson. "It's been exciting to come in and hit the ground running, joining such a solid firm. We have some exciting new programs and products in the works in support of our work for economic development organizations, manufacturers, and utilities across the country. 2017 is going to be a great year." Gibson can be reached at 608.663.9218 or sgibson@adyadvantage.com. Ady Advantage is a comprehensive and integrated economic development, site selection, and marketing consulting firm helping over 300 economic development organizations, manufacturers, utilities, and other sectors grow and diversify. For economic development organizations, we offer an integrated solution set that includes economic strategy, market differentiation, and go-to-market strategies. For our corporate clients, like manufacturers, we focus on research, competitive positioning, marketing strategy, integrated communications, and facility expansion, contraction, and relocation. Learn more about Ady Advantage at to www.adyadvantage.com.